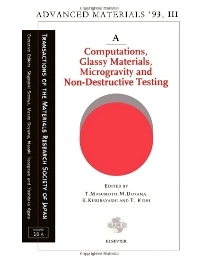 Computations, Glassy Materials, Microgravity and Non-Destructive Testing is a compilation of the papers presented during the Third IUMRS International Conference on Advanced Materials International Union of The Materials Research Societies that discussed the concepts and methods behind glassy materials. The book is divided into parts. Part 1 tackles the progresses in sol-gel science and technology; the reaction mechanisms of ormosils and effects of ultrasonic irradiation; and the preparation of different glasses and their properties. Part 2 covers topics such as the neural network system for the identification of materials; the use of computers for simulations of many-body systems; computer system for meeting the supercomputing needs of materials; quality control of materials information by knowledge base; and the development of knowledgebase system for computer-assisted alloy design. Part 3 deals with the properties of different materials, the concepts, and the techniques behind them, and Part 4 discusses the non-destructive evaluation. The text is recommended for chemists and engineers in the field of materials science, especially those who wish to know more about the progress in its field of research. Electronic Structure of Metal/Ceramic Interfaces Fabricated by "Surface Activated Bonding"